British Labour leader slams Tories' austerity agenda and PM Theresa May's "disdain for the powerless and the poor", writes Jake Johnson. 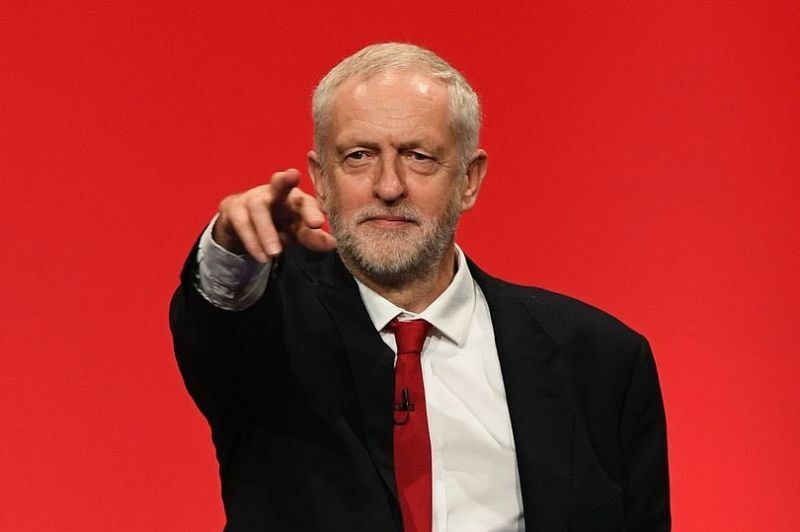 IN A ROUSING speech at the Labour Party's annual conference in Brighton, England, on Wednesday, Labour leader Jeremy Corbyn took aim at the "callous and calculating" austerity agenda of Prime Minister Theresa May, slammed the "failed dogmas of neoliberalism" that produced the deadly Grenfell Tower fire and argued that his party – bolstered by its ambitious "for the many, not the few" manifesto – is now at the "threshold of power". "We are now the political mainstream," Corbyn declared to a packed auditorium. "Our manifesto and our policies are popular because that is what most people in our country actually want, not what they're told they should want." Corbyn shocked the world in June when he far surpassed expectations in the snap election called by May, who believed – along with much of the U.K. media and political class – that she would win in a landslide. But Labour's fortunes shifted when the party unvieled its explicitly leftwing "manifesto for a better, fairer Britain", which was enormously popular with the British public. "... the largest increase in the Labour vote since 1945 and achieved Labour's best vote for a generation." "Yes, we didn't do quite well enough and we remain in opposition for now, but we have become a government-in-waiting," Corbyn said on Wednesday. "And our message to the country could not be clearer — Labour is ready. Ready to tackle inequality, ready to rebuild our [National Health Service], ready to give opportunity to young people, dignity and security to older people, ready to invest in our economy and meet the challenges of climate change and automation, ready to put peace and justice at the heart of foreign policy." Condemning the "disdain for the powerless and the poor" exhibited by the Tories, Corbyn pointed specifically to the catastrophic Grenfell Tower fire as an example of the "failed and broken system" that persists to this day, despite having been discredited after the global financial crisis of 2008. "Ten years after the global financial crash the Tories still believe in the same dogmatic mantra — deregulate, privatise, cut taxes for the wealthy, weaken rights at work, delivering profits for a few, and debt for the many. Nothing has changed." The only way forward, Corbyn argued, is to replace this failed status quo with a "new consensus" that seeks not merely to "redistribute within a system that isn't delivering for most people, but to transform that system". And Corbyn's vision of systemic change reached beyond the borders of the U.K. as he called also for deescalation of tensions between North Korea and the United States, an end to the oppression of the Palestinians and the Rohingya, and termination of the Saudi assault on Yemen, which is fueled by both Britain and the United States. "... genuinely putting power in the hands of the people, the creative, compassionate, and committed people of our country." "We will do politics differently," Corbyn said. "And the vital word there is 'we'. Not just leaders saying things are different, but everyone having the chance to shape our democracy." Subscribe to IA. A new way.